The easiest Pesto Pasta Salad ever! This recipe only calls for a few simple ingredients, and it tastes like summer. Looking for a super simple side dish to make all summer long? 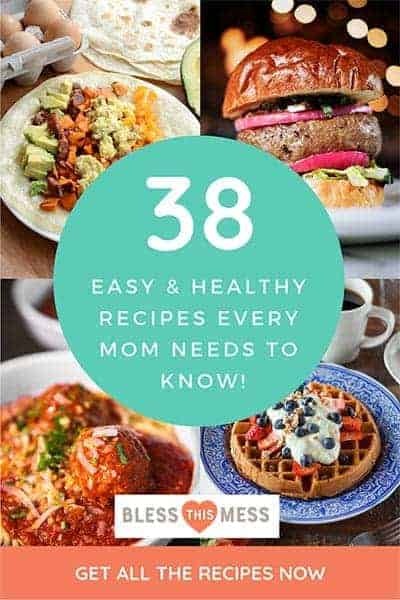 Well I have just the recipe for you today! This super easy Pesto Pasta Salad is one of my all-time favorite quick and easy side dishes that I serve all summer long. This is the perfect addition to any meal (it’s great with a bit of grilled fish, some seasonal fruit, and a loaf of crusty bread), it travels well so it’s great to take to a party, and the leftovers are one of our favorite simple summertime lunches. You just can’t beat simple seasonal ingredients that come together with very little effort or fuss. I have a cousin who lives a few hours away who has started a summer side business of making the most delicious pesto I’ve ever eaten. Lucky for me, her mother-in-law lives just down the road from me. When she’s coming to town she always asks if I’d like her to bring over a batch of her fresh homemade pesto. It’s thick, it’s creamy, and it tastes like summer. I can’t wait for her to start making it again this year. If you can use fresh pesto for this recipe, I’d recommend it. You can make it, get it from your cousin, or pick some up at the farmer’s market. If you don’t have any fresh pesto, the shelf-stable jarred kind from the store works well, too. I’ve used both with great success. When it comes to the mozzarella, the fresher the better. I’ve seen people use cute mini mozzarella balls in recipes and though I couldn’t find any close to me I think they would look and taste great in this recipe. And like all of the other ingredients, the closer to garden fresh the tomatoes can be, the better. When you only have a handful of ingredients in the recipe, it’s important they they are all as good of quality as you can get. This travels well when kept cool. 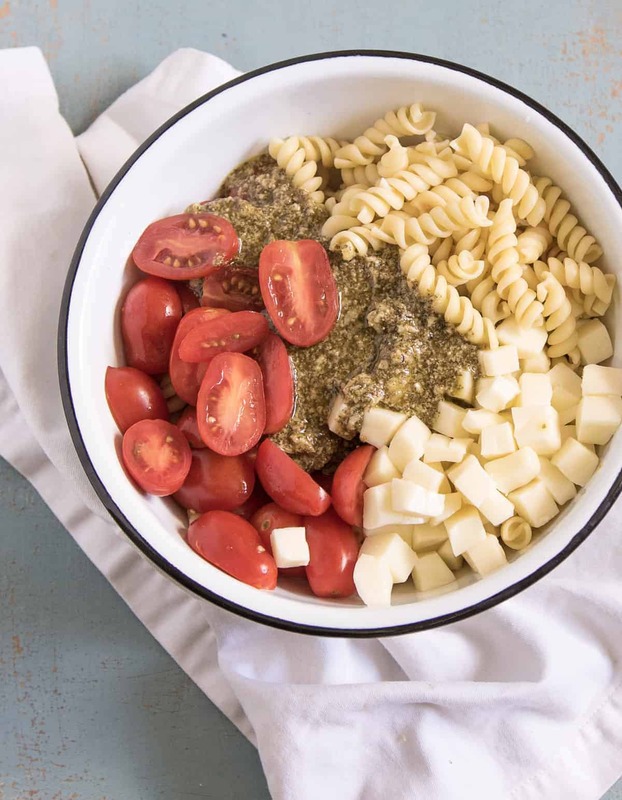 The pesto absorbs into the pasta when it sits so either plan on adding half the dressing when you make it and half the dressing when you serve it or simply add another spoonful of pesto and a drizzle of olive oil before eating the leftovers. This is delicious served with a berry loaded side salad and a loaf of no-knead crusty bread. 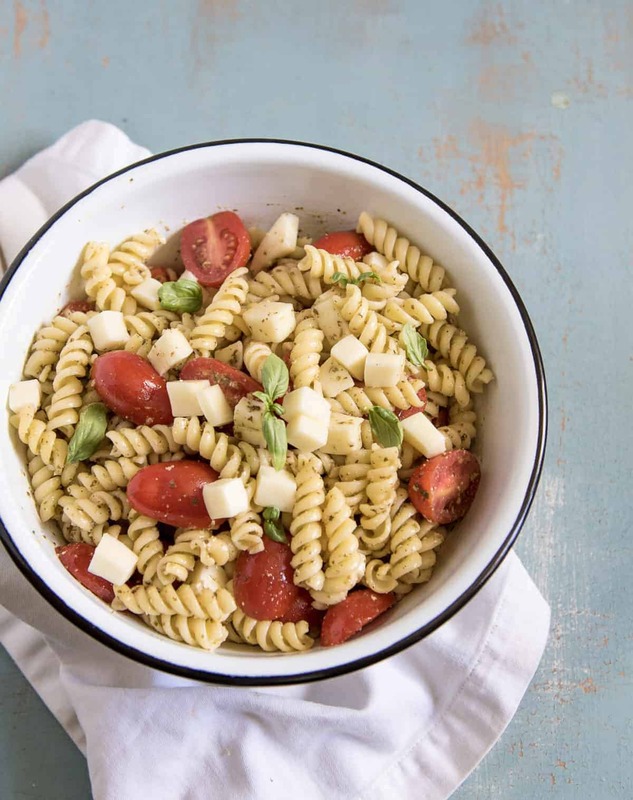 The easiest Pesto Pasta Salad ever! This recipe only calls for a few simple ingredients and it tastes like summer. Add the pasta to a medium mixing bowl. Add mozzarella, cherry tomatoes, and basil. In a small bowl, whisk together the pesto and olive oil. Add the pesto dressing to the pasta. Add a little more pesto and olive oil to this salad on the second day to refresh the leftovers before serving. 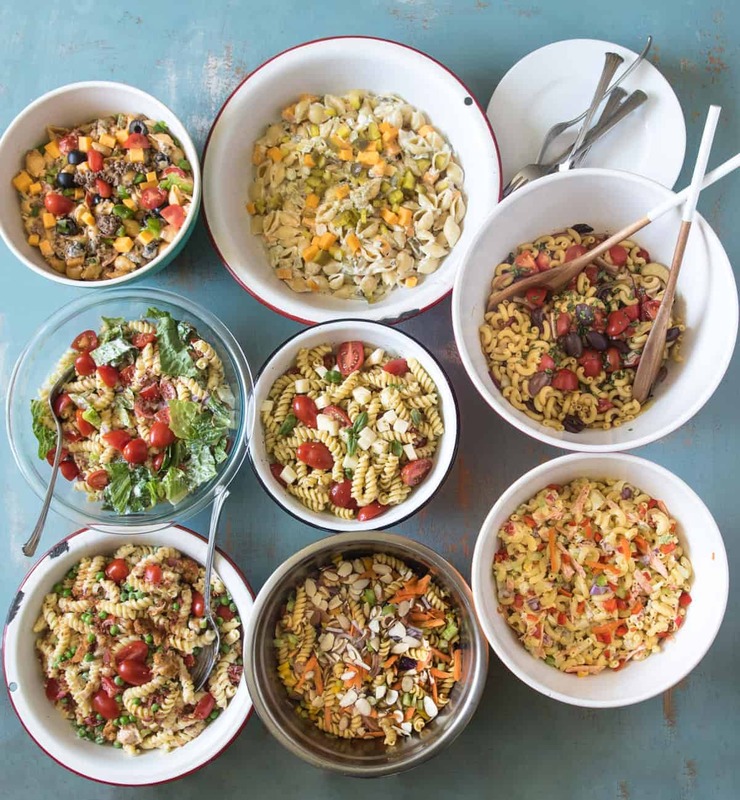 So many pasta salad recipes coming your way! Be sure to be on the lookout for all of them! 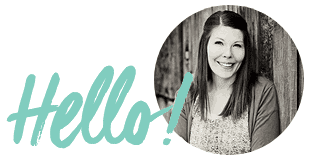 Melissa, I feel like you were channeling me when you created this recipe! I LOVE everything going on in here–I actually have some mini mozzarella balls in my fridge right now because they’re my fave afternoon snack :). I know this is going to make an appearance in my kitchen soon. If only I could convince one of my cousins to make some pesto I’d be all set! I’ll ship you some! That fresh cousin-made pesto is life changing. Something about summer just says pasta salad and I’m always up for anything quick and easy! Can’t wait to try this with your no-knead crusty bread. Looking forward to all the other pasta salad recipes that are coming! That bread is legit the best. Sometimes I even make it into more of a baguette shape and serve it up for bruschetta with summer tomatoes!